Korea PetroChemical Industry Association (KPIA) hosted the New Year’s greetings ceremony on Jan. 8 at the Sapphire Ballroom of Lotte Hotel. Some 150 CEOs, key executives of member firms and guests attended the event, which was led by Minister Sung Yun-mo of the Ministry of Trade, Industry and Energy and Chairman Moon Dong-joon of the association as the host of the event. In his speech at the event, Minister Sung thanked the petroChemical industry for its great contributions to boosting the nation’s exports to exceed a record $50 billion worth of products. He pledged government’s support for the industry this year, with rising uncertainty amid a global glut and slowing demand, by sticking to its push for the Manufacturing Reform Strategy announced at the end of last year by mobilizing all available policies. He urged the industry to continue to boost its exports while making daring investments, diversification of raw materials and taking preemptive actions for the hydrogen economy, a future growth engine. The government will invest 14.5 trillion won this year in a number of key areas, including upgrading the petroChemical industrial complex for development as a raw material belt, the vitalization of the hydrogen economy, including the development of hydrogen vehicles and the construction of a structure for the production of hydrogen, among others. 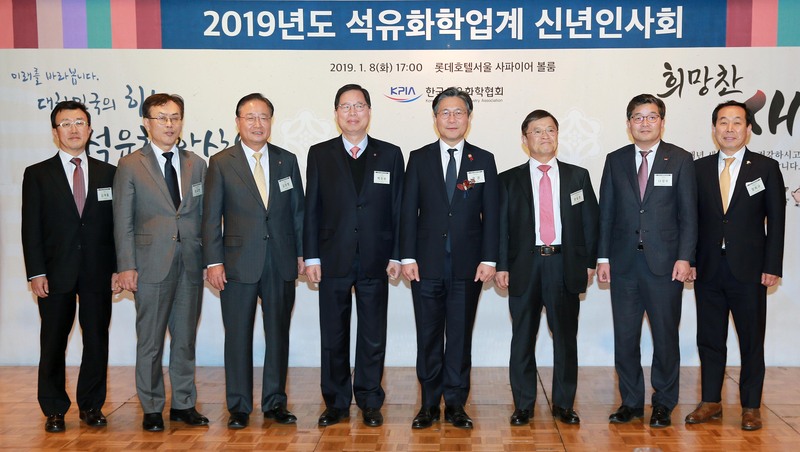 The minister hoped that 2019 would be a year for Korea to be a strong country in the global hi-tech Chemical industry, with the public and civilian sectors cooperating together amid a tough environment. Chairman Moon said that the past year will go down as a record year for the export of petroChemical products, which totaled some $50.1 billion, boosting the role and respect for the petroChemical industry. But this year we need change and reform to overcome a series of tough problems facing the industry, including tariff problems between the U.S. and China, with no end in sight, a global glut, and a slowdown in demand for products of key industries in the country. The chairman urged a number of issues that the petroChemical industry has to solve to overcome its problems this year. First, the industrial structure should be reformed to be a hi-tech, high value-added one. Second, the public relations campaign should be strengthened to improve the negative image for the industry with the main spotlight on the new environmentally-friendly products that the industry will have to turn out. Third, the industry should secure and maintain open communication with the government and boost investments to improve the quality of its products, while environment and safety is maintained as an essential part in its operation. Fourth, minimize the risk factors in trade thru improving the trade structure in the area of upgrading the quality and diversifying the export market and products.